Irori Music are proud to present our second EP: Hyakki Yagyō! 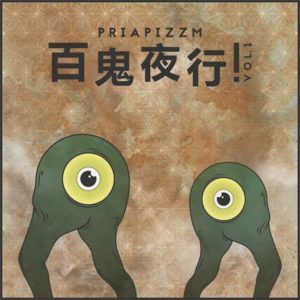 Volume One, the first in a series featuring collaborations between Priapizzm and a collection of very talented artists from around the world. Each track is named after a different Yōkai, ancient monsters from Japanese mythology. Hyakki Yagyō translates literally to “Night Parade of One Hundred Yōkai,” and our plan is to release one hundred collaborative tracks before bringing this series to a close. For Volume One, we have assembled artists from Japan, Costa Rica, and the United States. These five tracks fall loosely on the “foresty” side of trance, although as always with Priapizzm, genre is not a major consideration. Art by Ricardo Mack @ PLAGUE Studios. Mastered by David Chaim Cohen @ Xexify. If you’re interested in Yōkai, we highly recommend the work of the legendary Mizuki Shigeru. This EP, like all our releases, was available first to Irori Music’s supporters on Patreon. It is still the only way to get 24-bit unmixed versions of the tracks, as well as quite a lot of other goodies. For more information, please click here. MP3 Download | FLAC Download | WAV Download · Download count: 9,454. Great sound! Amazing quality! An easy flow and dense trip! <3 <3 <3 Great hard work, keep it up! I am so absurdly proud that someone is using my music as the background to their Warcraft III gameplay videos. Also, 1,000 downloads in 3 days?!?? AWESOME!!!!!!!!! WAS WAITING HERE FOR THAT!!! This is absolutely brilliant stuff!! Nicely done!!! What’s up with these downvotes? Amazing production, Chimi is my favourite.